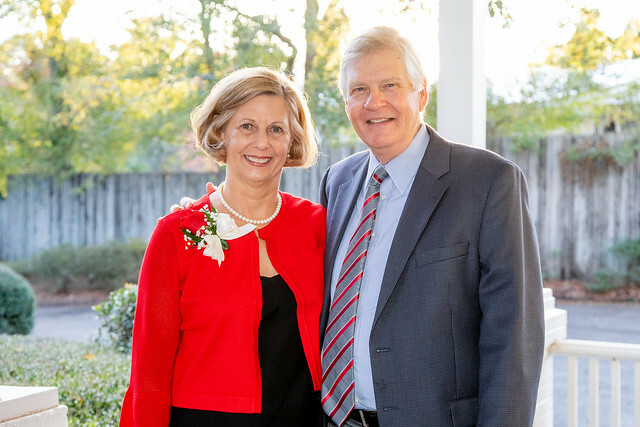 On Nov. 16, 2018, the UGA College of Public Health celebrated the retirement of its founding dean Dr. Phillip L. Williams in Quarters A on the Health Sciences Campus. The event paid tribute to the Williams legacy and featured comments from President Jere Morehead, Interim Provost Libby Morris, faculty, former students, professional colleagues, and Williams himself. An oil portrait of Williams painted by Athens, Ga. artist Greg Harris was unveiled at the celebration’s conclusion. Under Dr. Williams’ leadership, the College was awarded full accreditation in June 2009 and was reaccredited for seven more years in 2014; has more than doubled the College’s initial enrollment to more than 1,000 current students; graduated more than 2,300 doctoral, master’s and undergraduate students; and moved sevem of the College’s eight units to the UGA Health Sciences Campus located at the former U.S. Naval Supply Corp School site. In addition, the College is now ranked third at UGA in generating indirect costs from external grants and fourth in total grant production. Dr. Williams has served as a UGA faculty member for more than 25 years, holding the Georgia Power Professorship in Environmental Health in the college’s Department of Environmental Health Science from 2001 until 2018. Dr. Williams, who also served as a faculty member at Georgia Tech, retires Dec. 1 with a total of 38 years in the University System of Georgia. You can view photos from the retirement celebration or download your favorites here.